This page is a translated version of the page Help:Login notifications and the translation is 37% complete. 2 Hvorfor fik jeg notifikationen/notifikationerne? 3 Hvad bør jeg gøre? 4 Hvordan fungerer denne funktion? Hejsa! Er du her fordi du modtog en notifikation om forsøg på at logge ind på din konto? Bare rolig! Din konto er stadig sikker. Du fik en notifikation fordi nogen prøvede (og fejlede) at logge ind på din bruger. If the login attempt was on a device or browser you haven't used before, then you got a notification after the first failed attempt. If it was on a known device or browser, then the notification was set off after five attempts. Notifikationerne blev lavet af LoginNotify, en feature der blev lanceret i 2017. Vær ikke en af dem! Selv hvis du har et stærkt password, kan det stadig være en god ide at ændre password alligevel, hvis du mistænker der er en anden der har prøvet at få adgang til din konto. The extension allows you to get an email when a user logs in successfully to your account from an unfamiliar device and IP. This is especially helpful for admins or other functionaries who are concerned that their rights might be misused. This notification is on by default. 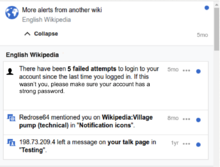 Note that the web notifications are disabled for this feature. The email text says: “Someone (probably you) recently logged in to your account from a new device. If this was you, then you can disregard this message. If it wasn't you, then it's recommended that you change your password, and check your account activity.” You can disable this in your preferences.